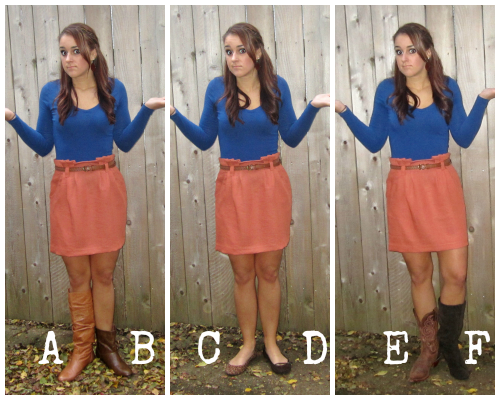 love, elizabethany: pinspired outfit: which shoes do i wear with this skirt?! pinspired outfit: which shoes do i wear with this skirt?! Oh dear. I definitely needed help yesterday in the form of a stylist, or preferably a shoe store in my closet. Why did I have two different shoes?! Because I really couldn't decide which ones to wear for this post/the Twilight premiere I had to work last night! I took pictures in 6 different pairs, and still couldn't decide, so now I'm asking for your help. Sure, it's a little late, but I'll definitely wanna wear this skirt again! Which shoes should I have worn with this outfit? I personally think the cowboy boots work the best because of their color, but wearing those things to a top-40 station event in Hampton is just unacceptable, so I went with option A... completely dissatisfied. For my hair, I wanted to do the hair-bow, but I quickly learned it's damn near impossible to do on your own hair unless you have super hands. Braids it was! 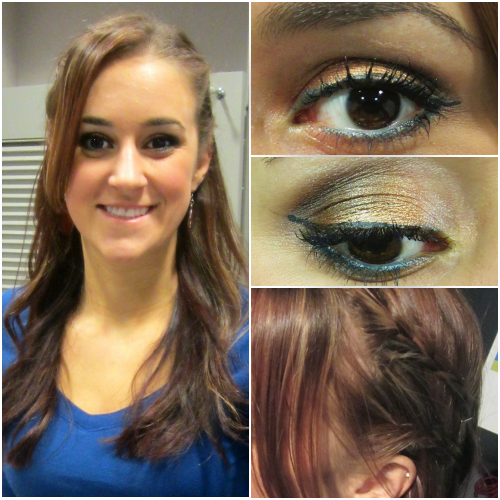 And my makeup- Neutral lids with brown eyeliner, and blue on the bottom! My new fave thing to do. Clearly I'm still no professional with this fashion stuff... which is the whole point of these challenges! I'm learning how to put things together [with your and Pinterest's help], and hopefully teaching you that cheap doesn't mean ugly/boring! Not even halfway done with this go-around.... Wish me luck through the weekend!